Food for Freedom offers you a self-sufficient food generator, providing you with adequate quantity of nutritious food, rich with vitamins and proteins. Climate is indeed changing but not the way you think, and not the way the Global Warming hoax portrays it. We already see its coming signs, just take a look at California and its biggest water reservoirs: Lake Shasta, Lake Oroville, Trinity Lake… are all below 30% storage capacity. In 2004 the University of Santa Cruz, California, released a disturbing report based on climate models titled “Disappearing Arctic Sea Ice Reduces Available Water in the American West.” The report accurately predicted that the melting Arctic will trigger high-pressure system that is blocking the path of storms to the Western hemisphere. In short, the California drought was accurately predicted and its causes have been well known for 11 years at least. But obviously, instead of acting to prepare, the government completely failed, as it usually does. This climate change, with a small c, has nothing to do with “Global Warming” or “Global Cooling” as it was called just 30 years ago. Instead, it is a part of the natural cycle due to rotation of the Earth and its position relative to the Sun. At this moment Earth is between two ice ages, the last one ending over 11,000 years ago, which means that around the globe temperatures are at their peak, with ice coverage at the poles at its lowest point. For the western states this means resorting to consumption of ground water, which has increased up to 70%, and experts believe that by the end of the year fresh ground water will account for all consumed water. However, when this runs out the consequences will be unprecedented for the North American continent. Consider that over half all fruits and vegetables are cultured in California, not to mention the cattle industry which has already hit a record low. The least of what can be expected are soaring food prices and accompanying social unrest, exacerbated by the fact that, currently, over 47 million people already live off food stamps. The Syrian civil war itself started because of failed crops and the skyrocketing cost of basic foods. Now imagine what would happen with a population several orders of magnitude larger, of which some groups are already highly prone to rioting. How can one hope to prepare for such an event? Food For Freedom, written by the journalist Frank Tanner offers a viable alternative to government incompetence and inevitable deterioration of society. It offers self-sufficiency through the building of an aquaponics garden system, based on co-dependent relationship between plants and fish: plants purify the water for the fish, while fish fertilize the plants with their waste. Such system needs no water as it recycles its own, and provides food yield many times its used space volume. 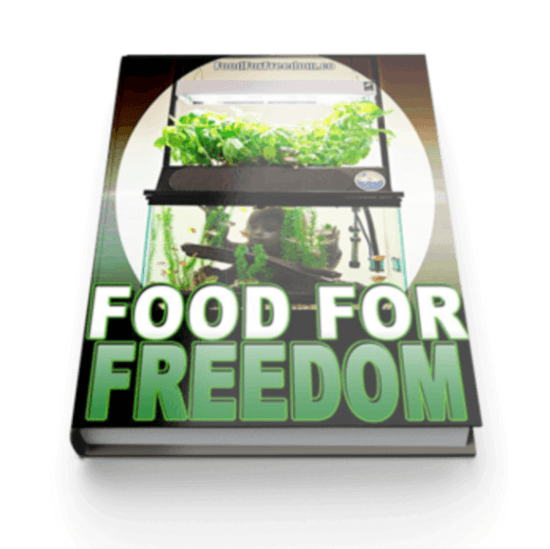 But Food For Freedom’s aquaponics system does not offer the know-how for just any aquaponics garden, it has been improved to such an extent that it costs a fraction of what would it normally cost – getting the cost under $150 for each grow bed and fish tank. It requires very little maintenance, and it has been reverse engineered and rebuilt in such a way that anyone could assemble it and run it, without prior DIY skillset. Effectively, Food For Freedom offers you a self-sufficient food generator…providing you with adequate quantity of nutritious food, rich with vitamins, proteins and carbohydrates. I am extremely interested in starting my own aquaponics set-up.